States of an entity is a very important concept of Hibernate. An entity can have different states. Using Hibernate is different from using SQL. If you call session.save(customerObject) then there is no insert into customer… query into the database. Hibernate will set the id property (if the id is generated) and bind the entity to a persistence context. The persistence context is synchronized with the database when transaction.commit() is called. You can continue to update an entity and all changes to the Java object are persisted with a single database insert/update. The update of a database table row causes a row lock. Having a row lock only for a short moment at the end of a transaction, prevents locking of concurrent users or dead lock situations. An object can have three states: transient, persistent and detached. When it is just created and has no primary key, the state is called transient. When the session is opened and the object is just saved in or retrieved from the database. This state is called persistent. During this state Hibernate manages the object and saves your changes, if you commit them. Below you can see an example. A car is saved and the name is changed afterwards. As the car is in persistent state, the new name will be saved. The following code loads a car by id and changes the name. There is no session.update involved. Every object which is loaded by session.get, session.load or a query is in persistent state. It is stored in the persistence context of the session. When tx.commit() is called, Hibernate will flush the persistence context and all not yet written insert, update and delete statements are executed. When the session was closed, the state changes to detached. The object is detached from its session. If you want to save the changes, you have to reattach your instance. This means the instance must be brought to a persistent state. You can not save an instance when it is not in persistent state, except if it was transient before and has no primary key set. You must reattach an object before you can update it. 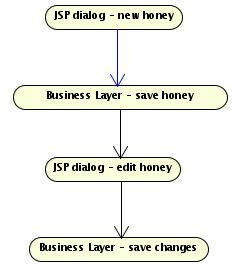 The following picture show the change of status how it could happen in a web application. You might be aware of the method session.lock(car). It is deprecated since Hibernate 3.6. How to deal with reattaching and state changes carefully is explained in detail in the chapter Working with Objects Chapter 3, Working with Objects.